I hadn't planned on doing much of anything on Sunday beyond yoga. I worked on Saturday, so it was my one day weekend, and I didn't feel much motivation. I knew that Sunday was the opening day of a new vegan food mall, but the energy to organise anything or drive was a bit much. But then I got a message from some friends... they had hired a car and were going down to it, they would pick me up and drive. All I had to do was show up, and eat. And those are two things I'm really good at! So, the place. The brand new The LC Miami. For sometime now I knew that Love Child was organising vegan laneway markets at the Gold Coast, though I'd never been. However, they have embarked on a new project. A two storey vegan destination - clothing, shoes, and accessories on the top, and several vegan food locations down the bottom. While the top level wasn't open when we were there, the food places were in full swing! I don't have any photos of the place itself, it was pretty crowded being the opening day. It is on the Gold Coast Highway, but tucked in between some other businesses. Look out for the two palm trees that mark the entrance! There is a small patio area out the front, which funnels into an indoor corridor lined with six vegan food businesses, and then opens out to an outdoor lawn area with tables, chairs, and umbrellas. Thankfully it was a lovey day when we were there, and we were able to get a table with lots of shade for my fair skin. I wasn't sure how the restaurants were going to be... the style is like a food court - but in the best possible way! You order at the counters, so you can take your food back to your table. This is great, as it means that you can sample something from many places. We sampled something from everywhere! I know you are all waiting to hear about what the food places were, so let's get to it! by Gigi: I was so excited for this. Regular readers will know that my favourite pizza place is Gigi in Sydney. And they have opened up an outlet here!!! OK, so it is not quite the same. This version is called by Gigi, and there are a few key differences. Firstly, the crusts seem to all be gluten free. They are amazing for gluten free crusts, I wouldn't actually have known, but they are not quite the same as the big puffy crusts that come from the original store. They also put vegan cheese on everything, which the Sydney store does not do. Not too much, but it was a bit odd considering what I was used to. But, they sell pizza by the slice or the half slice, so you can try lots of flavours if you want, or leave room for the other restaurants. 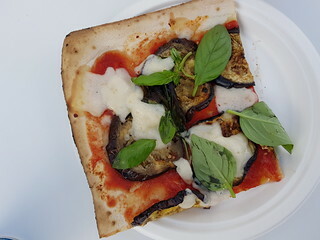 I got a slice of my favourite from the Sydney store - the Melanzane. It wasn't as life changing as the one from the Sydney store, but was still a fine slice of pizza. My friends got a half slice of this, and a full slice of the mushroom and olives. They also have a gelato bar. I love ice cream, so I was excited for this! It is not what I was expecting, but I really enjoyed it. 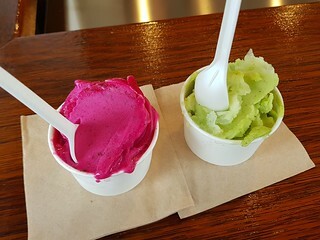 They have three flavours, which I assume will change depending on season, that are based on fruit and herbs. I got the Arancione, a beautiful fuchsia mix of rockmelon, beetroot, and rosemary. It was lovely. My friends had the refreshing Verde - apple, celery, and mint. They third flavour was Rosso, which had strawberries, cherry tomatoes, and rocket. So unique! Flora by Greenhouse: Greenhouse Canteen & Bar has had a long association with Love Child. They have two pretty fancy restaurants down at the Gold Coast, but now they also have Flora. Flora is a cafe style deli, with breakfast and lunch options. They had a range of sandwiches, salads, quiches, and hot dishes when were were there. 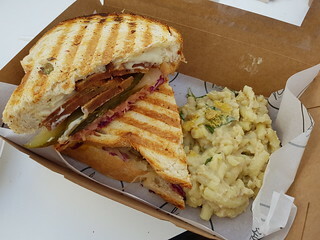 I couldn't resist getting the Reuben Sandwich with a side of Mac and Cheese. The sandwich was GIANT! I only ate half of it in the end, and brought the other half home to take to work for lunch yesterday (it was still good as leftovers). The reuben was tasty, but not quite a reuben. It had a very strong mustard taste, and the corned seitan was sliced a bit too thick. It was still a great sandwich. The mac and cheese was very creamy, but could have had a lot more cheesy flavour to it. 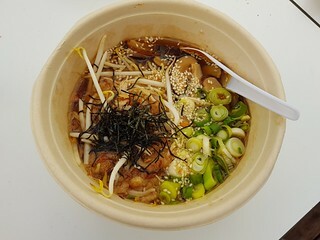 i like ramen: i like ramen has long had a pop-up vegan ramen shop down at the coast, but I was never able to get there. I was really happy when they announced they were having a permanent location! I got the mushroom ramen, hold the chili. It was really nice, a great savoury broth and lots of mushrooms. Really satisfying! Burgers vs Kebabs: BvK is a shop that sells, you guessed it, burgers and kebabs. We were already full of ramen, sandwiches, and pizza by this point. But, we wanted to try at least one thing from every place. They have quite a nice looking burger selection, but we went for something small and shareable with the Vegan Poutine. 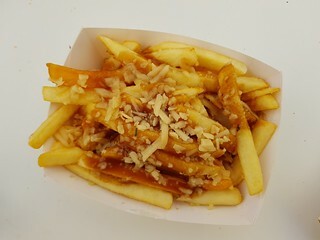 We watched them get the freshly cooked chips, top it with some gravy out of a tub, sprinkle on some cold grated cheese, and then... put it in the microwave. Our hearts sank. As expected, it was pretty soggy. It tasted OK though, the gravy was nice and savoury, though the chips were a tad salty. Flour of Life: If you are worried about dessert, and not in the mood for fruity gelato, never fear. Flour of Life has an outlet here as well. They are full of doughnuts, tarts, and other delicious treats, as well as savoury pies, sandwiches, and sausage rolls. Or they normally were. By the time we were leaving, and picking up some take home treats for our final stop of our eating tour, they were sold out of a lot. Which is fantastic! In fact, a lot of places sold out before the end of the night, there was so much interest. 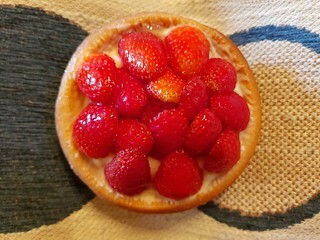 Anyway, thankfully they still had one of my beloved strawberry flans that I picked up to take home. So, there we have it. For research and science and blog posting, I ate until I was very full! The hardships of being a vegan, the struggle... so real! I'd definitely go back here again, or pick up something to takeaway if I was down there for other reasons. There is a nice mix of food, and the atmosphere is lovely (though if it was raining or a super hot, sunny day, that would be less good). I will be interested to see when the upstairs opens as well! 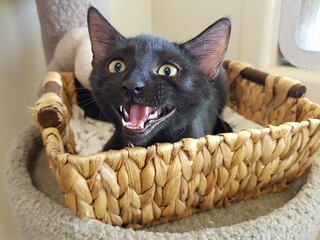 Jimi is asking if you would like to take him home! If you are in Brisbane, and want to meet him, let me know! How sad to put freshly mae fries in the microwave! At least the rest of the food looks pretty amazing. It's awesome that a pizza place offers half and full slices! I want to take Jimi!! 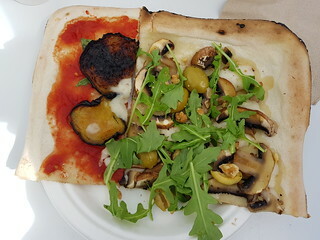 Next time I am there I think I will get a few different half slices so I can try more flavours. OMG, Jimi!! What a cutie! If I were in Brisbane, I'd want to meet him! That pizza looks fantastic, and yay for vegan ramen! But I don't feel okay about arugula gelato. Ha!!! NOOOOOO. :-) Everything (even the microwaved fries — I weirdly like soggy fries) sounds great. I was into the strawberry and tomato combination, but I am not a big fan of rocket so I went for the fruitier option. TBH, I'd prefer more traditional ice cream, but these are still fun.